"Sliced cucumbers in a creamy sauce, great on hot summer days." Sprinkle salt over the cucumber slices in a large bowl, making sure all slices get some salt. Set aside until liquid drains from cucumber slices, 3 to 4 hours. Drain liquid. Squeeze cucumber slices with paper towel to express as much moisture from them as possible. Mix evaporated milk and vinegar together in a glass bowl until thickened. Fold cucumber slices into the milk mixture; season with black pepper. 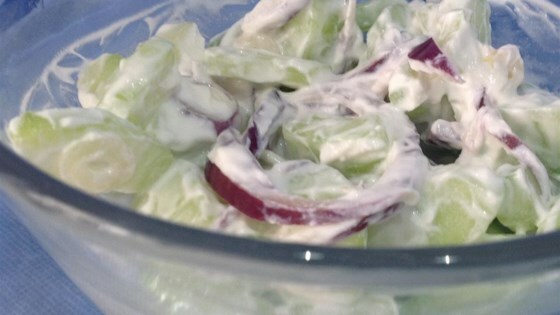 Watch how to make this simple, tasty salad. I'd swap out the evaporated milk with a little Miracle Whip or mayo mixed with more sour cream and a lot of dill. No evaporated milk in the house. Used 1 part condensed, 3 parts 2%. Added onions. I could eat the whole bowl myself!! Not bad, I added some dill. I only had two large cucumbers so I used less condensed milk. The kids thought it tasted like european cucumber salad. Easy to make.